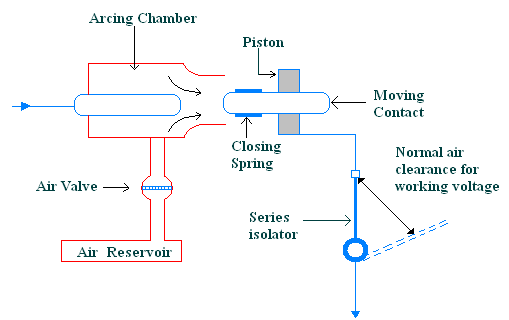 An auxiliary compressed air system of an air blast circuit breaker consists of a fixed contact and a moving contact, enclosed in an arc extinction chamber. Under normal operating Conditions, both the contacts are closed. Whenever a fault occurs, high currents are induced which raises the temperature. When the air is submitted into the arc extinction chamber the air pushes away the moving contact establishing an arc. The air inside the arc extinction chamber will have high pressure than the atmospheric pressure. The air blast cools the arc and sweeps away all the ionized gases along with it. Because of this, the dielectric builds up rapidly, between the contacts, which prevents the reestablishment of arc. Thus, the flow of current is interrupted. The difference between two types of Air Blast Circuit Breakers is just air flow direction with respect to the arc.in axial type air flows in direction of arc.In cross blast air flow direction perpendicular with respect to arc. 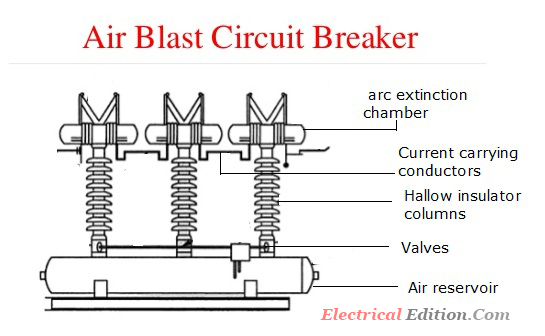 A typical EHV air blast circuit breaker is shown in figure, which consists of the following components. In air reservoir, the air of high pressure with an atmospheric pressure of 20-30 atm is stored. The air is taken from at: silt compressed air system. The hallow insulator columns are mounted on air reservoir with valves provided at base. It carries air from reservoir to an arc extinction chamber. The are extinction chamber is mounted on the top of the hallow insulators columns. It consists of a fixed contact and a moving contact with a spring mechanism. Depending upon the pressure of air the moving contact opens (or) closes the ail outlet valves. The purpose of valves is used to supply the air from the air reservoir to hallow insulator columns and an arc extinction chambers. This is happened when the valves are kept open. Similarly when the valves are closed it stops supplying the an insulator columns and are extinction chambers. The current carrying conductors links all the arc extinction chambers in series and the poles of neighboring equipment. When a breaker receives a signal either pneumatic or electrical the rod connected to valves gets opened. During tint instant. the air enters into the hallow insulator column and further enters into arc extinction chambers. Because of high pressure in are extinction chamber, the pressure increases on the moving contact and becomes more than the spring pressure. Hence. the contacts are separated. Because of high pressure on moving contact, it travels a short distance against the spring pressure and closes the air outlet valves. As a result-the high pressure air in the arc extinction chamber is not let to go out However. at the arcing period the air goes out through the air outlet valves with all ionized gases. Later, if the valves are closed. then the air in the insulator column is let into the atmosphere, due to which the pressure on the moving contact is dropped to atmospheric pressure. Hence. the moving contact closes over the fixed contact by virture of its spring pressure; in the applications of high voltage installations, air blast circuit breakers are very much preferred and by using these circuit breakers the tire hazards are eliminated. 1.Due to absence of oil in air-blast circuit breaker, risk of fire and maintenance of oil is eliminated. 2.Deterioration of oil is eliminated and the arcing products produced are completely removed. 3.Fast operation is possible and suitable for indoor installation. 4.Suitable for rapid reclosing at successive operation and has a very high rupturing capacity. 5.It is easily accessible. It has relatively less weight. 1.The construction of air-blast circuit breaker is very complicated. 2.Compressed air system consisting of electric motor, air compressors etc., are required for installation, which increases the cost. 3.They are very sensitive to variations in RRRV (Rate of Rise of Recovery Voltage). 4.Maintenance of plant requires highly trained personnel. 5.Cost of operation is high.